The triangular relationship between the social, the political and the cultural has opened up social and political theory to new challenges. The social can no longer be reduced to the category of society, and the political extends beyond the traditional concerns of the nature of the state and political authority. the major theoretical problems in recent social and political theory. 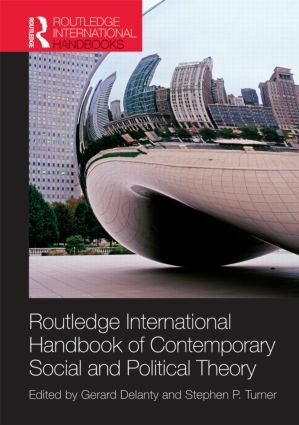 The Routledge International Handbook of Contemporary Social and Political Theory encompasses the most up-to-date developments in contemporary social and political theory, and as such is an essential research tool for both undergraduate and postgraduate students, as well as researchers, working in the fields of political theory, social and political philosophy, contemporary social theory, and cultural theory. Gerard Delanty is Professor of Sociology and Social & Political Thought at the University of Sussex. He has edited several volumes, including (with Krishan Kumar) the Handbook of Nations and Nationalism (Sage, 2006), and the Handbook of Contemporary European Social Theory (Routledge, 2006). His most recent book is The Cosmopolitan Imagination (Cambridge University Press, 2009). Stephen Turner is Graduate Research Professor of Philosophy at the University of South Florida. He is the author or editor of a number of books on Max Weber, including the Cambridge Companion (Cambridge University Press, 2000), and other books including The Social Theory of Practices (Polity Press, 1994), Liberal Democracy 3.0 (Sage, 2003), and Explaining the Normative (Polity Press, 2010).